LONDON - In the swinging 60s, Paul McCartney exchanged vows with his beloved Linda (Eastman) here (1969). Their supposedly ­low-key wedding sparked a media frenzy as hundreds of fans mobbed the newlyweds. In the 80s, Paul’s fellow Beatle Ringo Starr also got married here. And Oasis’s Liam Gallagher wed both his wives here – first Patsy Kensit and then Nicole Appleton – 11 years apart. 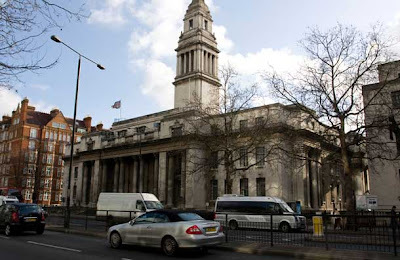 Westminster Register Office, also known as Old Marylebone Town Hall, has more than its fair share of rock ‘n’ roll wedding history. Loved by stars for its history, photogenic architecture and central London location, the town hall is the capital’s busiest register office. On an average summer Saturday, 12 weddings and civil partnerships take place under its grand roof, while many more are held at approved venues in Westminster. All births and deaths in the borough of Westminster are also registered at the town hall. The historic venue, which opened in 1920, now also plays host to citizenship ceremonies, which officially welcome new citizens to the country. Couples can choose from four rooms – the tiny Yellow Room, which holds 20 guests, the Blue Room, which holds 30, the Purple Room, which holds 80 or the grand, wood panelled Reception Room which holds 100 guests. “We chose to marry here as it’s where Paul and Linda got married,” grins Kasia Jablonska, who is marrying Michael Foye, 41, in the Blue Room on the day we visit. Kasia, 37, who is Polish, and Australian Michael have been engaged for six months but only started planning their wedding two months ago. Bea Tomas, 32, and Paul Garrad, 35, are embracing the hall’s rock ‘n’ roll history. They chose the Yellow Room after finding out it was where Liam Gallagher had married both first wife Patsy Kensit in 1997 and second wife Nicole Appleton in 2008. The couples are in good company with scores of well-known faces choosing the register office for their weddings. In the 90s, Chrissie Hynde, the singer, married her composer partner here. The couple wore jeans and celebrated at a nearby Pizza Express, with guests including Annie Lennox. “I’ve married numerous stars here,” says Alison. “Antonio Banderas and Melanie Griffith were one of the first majorly exciting couples I met. “I married Dave Gilmour of Pink Floyd and the rest of the band were there supporting him. More recently, I’ve married actors John Hurt and Terence Stamp, former footballers John Fashanu and Paul Merson and TV presenter Claudia Winkleman. “Westminster may be described as a ‘rock ‘n’ roll’ venue but it appeals to all sorts of people.